Instagram may have re-invigorated its offering with the help of Snapchat, but this method of adoption has been going on for years between some of the world’s biggest tech companies, according to Jack Delosa, entrepreneur and CEO of The Entourage. When Picasso said, “Good artists borrow, great artists steal”, he did not mean this in an unethical way. He meant that where average artists simply copy someone or something else, great artists will take an idea and, through their own creativity, make it their own. It’s not something they’ve borrowed – they now have ownership. Has Instagram just executed the greatest tech heist of recent years? While Snapchat loyalists may criticise the move, Instagram has simply done what all great companies do when world’s best practice outpaces them – they incorporate it in their own way. Facebook’s News Feed came from FriendFeed, a company it acquired in 2009, and this format that was then rolled out by most social media giants. Instagram popularised photo filters, Snapchat re-imagined them, and now most platforms offer filters as an option. The interconnectivity between each of these ideas forms a web between all of the major players who are at the forefront of a rapidly emerging space. While happening faster than ever before, this pattern of behaviour is not new. Apple didn’t invent much. Steve Jobs was introduced to the computer ‘mouse’ when he visited Xerox’s Palo Alto Research Centre in 1979. The brilliance of Jobs and his business partner, Steve Wozniak, was in making it more human and bringing it to the consumer in a way that Xerox didn’t. Apple also didn’t invent the personal computer, the phone, the tablet or even music sharing. In a tech world that was focused on building technology and would later ask “How do we market it?”, Apple would always start with the consumer, find the seed of technology from somewhere else, and then make it their own. Apple’s brilliance has always been finding an invention, adding innovation, and wrapping it in something that touches our heart in a way that other technologies don’t. Between 2013 and 2015, the average number of posts on Instagram per user declined, while Snapchat usage was up 25 per cent from just February to April, reaching 10 billion daily views. A few days ago, Snapchat was disrupting Instagram. With a steep growth curve and high user engagement, Facebook unsuccessfully offered to buy them for $3 billion. Snapchat had captured the attention of the giant. Now Instagram is disrupting Snapchat. If this play highlights anything, it’s that disruption is most effective when one company takes the strengths of another and turns them into weaknesses. One of Snapchat’s strengths is that it’s the party your parents haven’t arrived to yet – it’s where the cool kids hang out. The not-so-intuitive interface means that when you join Snapchat, you need a friend to walk you through how it works. Again, this acts as a deterrent to the less-tech-savvy among us and helps Snapchat maintain its mystique and exclusiveness. Instagram’s strengths lie in its one billion-strong usership. Integrating Stories to its interface means more people see your content. Snapchat’s exclusivity isn’t as cool anymore when you can reach double the audience on Instagram. In taking the story format to a larger audience, Instagram has also made it easier to use – something Snapchat has seemingly deliberately avoided. Rather than swiping up during someone’s story in order to send them a message, Instagram has a “Send Message” button. Plus, there’s no limit to worded captions, which has forever frustrated many Snapchat users. Part of Snapchat’s mystique has been to deliberately not have a search function, in contrast this is something that is inherent in Instagram, making it easier to navigate and find new connections. For brands and influencers, this enables them to more effectively build audiences. From an advertising perspective, the ambiguity around Snapchat analytics and the limited paid advertising options has also meant that it traditionally has never been a favourite amongst businesses. While advertising is still relatively new to Instagram, and yet to be incorporated into the Instagram Stories feature, the advertising and analytics functionality on the platform makes it more appealing to traditional advertisers who need to be able to show quantifiable data and a direct return on interest in any 90-day window. Ultimately for any company, the best defensible barrier to competition copying you is to constantly be innovating and working on getting better every single day. Since I started The Entourage a little over six years ago, great organisations have popped up from students, graduates and partners of ours with similar models and similar value propositions. I have always encouraged this and helped wherever I could. Firstly, because The Entourage did not invent education for entrepreneurs – we hold no claim on it. And secondly, because our vision is to push civilisation forward by enabling more people to live on purpose – the more companies that aim to achieve a similar tipping point only serves to enable that vision. Has it affected my business? Not by one basis point. Nada. Nill. Zip. Because we keep innovating and we are forever evolving. If you copied who we were a year ago, our organisations would already be unrecognisable. Innovation and competition doesn’t threaten anybody who has the tenacity to stay ahead of it. Facebook (which owns Instagram) as a tech giant now does what large companies have always done – wait for new upstarts to prove a concept and then acquire them before they become too disruptive to its patch. Since its $3 billion offer for Snapchat was refused, Facebbok has replicated it in Instagram for their audience. I do wonder whether this presents a new trend in the tech landscape? Does this move demonstrate that there is less of a need for large tech companies to pay big dollars for a high-growth agitator, when they can simply duplicate the format and integrate it into their existing platform where our attention already is? In the meantime, where do I think you’ll end up posting most of your stories? Where you get the most views. And right now, your Snapchat following isn’t nearly as big as your audience on Instagram. 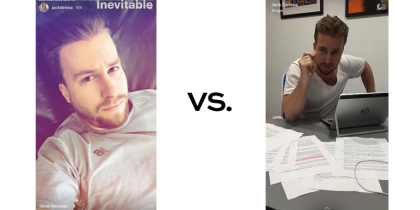 This article was originally published on www.jackdelosa.com.